ATAC Resources Ltd. Identifies Addi… | ATAC Resources Ltd.
January 16, 2019 - Vancouver, BC - ATAC Resources Ltd. (TSX-V:ATC) (“ATAC” or the “Company”) announces final 2018 exploration results from its 660 km2 Rau Project, located at the western end of the Company’s Rackla Gold Property, Yukon. The remaining results from the highly prospective Bobcat, Condor and Spotlight targets have advanced our understanding of the broad controls on mineralization throughout the district. The results of this program continue to provide compelling evidence that the Rackla Pluton is one of multiple intrusive-related systems on the Property. Polymetallic intrusive-related mineralization has been identified over a 20 km trend to date, and varies from proximal skarn, through intermediate and distal carbonate replacement and manto systems. Hand pitting at Condor identified zone rich in zinc, including samples containing 37.49% and 36.51% zinc. Bobcat is a gold-copper skarn target located 1.5 km east of the mapped surface expression of the Rackla Pluton. Prospecting and hand pitting in early 2018 returned numerous multi-gram gold and multi-percent copper grab samples; including: 6.07 g/t gold with 7.41% copper; and 5.08 g/t gold with 3.69% copper (please see ATAC news release dated August 21, 2018). Follow-up work completed in September identified additional gold mineralization including a surface grab sample grading 9.53 g/t gold, broadening the target area of skarn mineralization to approximately 250 m in length. Expanded soil grid coverage east of Bobcat has identified a 1.2 km by 1 km soil anomaly for silver, lead and tin. The anomaly remains open to the east. The furthest east line of this grid contained a sample grading 14.55 g/t silver in soil. Gold-copper skarn mineralization at Bobcat is typically observed within tremolite bearing veins with varying concentrations of chalcopyrite and copper oxides hosted in fine grained limestone. This style of mineralization is characteristic of distal, retrograde skarn alteration related to an intrusive center. Host rocks observed in the Bobcat area consist mainly of fine grained limestone, marble, hornfelsed fine-grained siliciclastic, and minor volcanic rocks. The Spotlight skarn target is located 6.5 km north of Bobcat. Work in 2018 included soil sampling and prospecting, to follow-up the 2017 discovery of high grade grab samples containing 7,080 g/t silver and 3.27 g/t gold. These samples were collected from a 500 m long gold and silver soil anomaly. Soil sampling in 2018 expanded the gold and silver anomaly to over 2.2 km in length. Highlight in-soil metal values 0.70 g/t gold and 15.20 g/t silver. This anomaly remains open to the north, east and west. One day of detailed prospecting was conducted in the Spotlight area during 2018. Rock samples returning 4,090 g/t silver and 1,765 g/t silver in limonite bearing quartz veins were collected near the initial discovery. Prospecting 1.2 km along the anomalous soil trend returned brecciated quartz-siderite material containing 2.17 g/t gold and 1.38 g/t gold. Significant hornfels, marble alteration and abundant tremolite development indicate high fluid flow, likely from a nearby intrusive system. These observations are supported by the development of gold-copper-tungsten skarn mineralization at the historic Blue Lite occurrence located 1 km to the south of Spotlight. The Condor target, located 1.5 km to the northwest of the Tiger Deposit was assessed in detail in 2018 to follow-up on an area of high grade prospecting samples (17.00 g/t gold and 23.30% zinc) collected in 2017. * Note: dashes indicate no significant result for that element. Condor is situated in a similar stratigraphic and structural environment to the Tiger Deposit, with a series of carbonate horizons interlayered with volcanoclastic flows. Mineralization at Condor is thought to have developed at the structural intersection of a regional scale northwesterly trending strain zone with a northerly trending brittle fault zone. 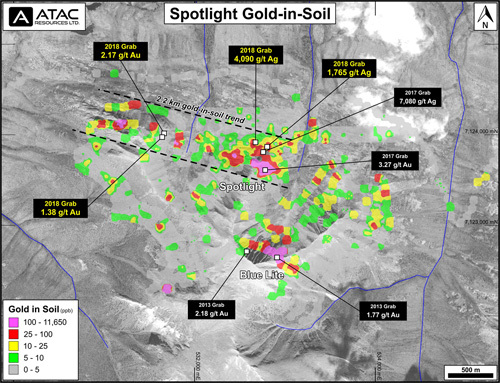 Since 2007, a total of 22 targets with gold and/or base metal mineralization have been discovered by ATAC across a 20 km trend at the Rau Property. These targets comprise several distinct styles of intrusive-related mineralization, demonstrating systematic zonation outwards from the Rackla Pluton. While underexplored, the Rackla Pluton represents one of the proposed hydrothermal fluid sources for the district and may have mineralized porphyry potential. 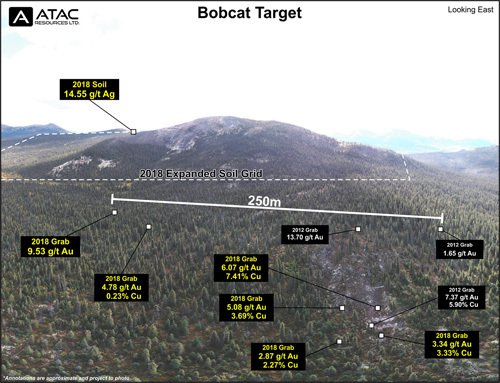 The neighbouring Bobcat target reflects outward fluid flow and the development of gold-copper skarn mineralization. This mineral zonation continues to transition outwards to a gold-silver dominated carbonate-replacement system exemplified by the Tiger Gold Deposit. At the periphery, silver-zinc-lead manto-style mineralization has developed at the Ocelot target, demonstrating distal components of fluid flow. 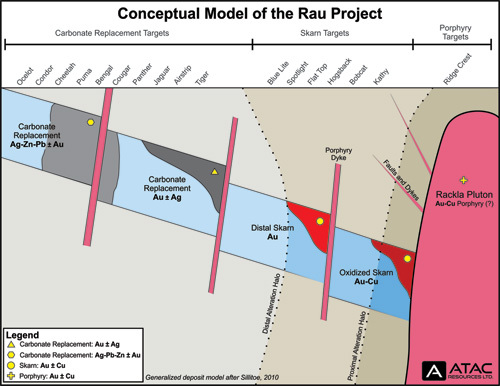 Systematic exploration at the Rau Project has revealed an exciting geological environment, which has already led to multiple discoveries and suggests a robust system with significant additional potential. Planning for the 2019 field program is currently underway and details will be announced in the coming months. Samples were forwarded to ALS Minerals in Whitehorse where they were fine crushed before a 250 gram split was pulverized to better than 85% passing 75 microns. Pulps were then analyzed at ALS Minerals in North Vancouver where gold determinations were carried out. Rock sample gold analyses were by the Au-AA26 procedure that involves fire assay preparation using a 50 gram charge with an atomic absorption spectroscopy finish. Initial multi element data for 49 elements was determined for rocks by the ME-MS61 procedure that involves a four acid digestion followed by inductively coupled plasma mass spectrometry and inductively coupled plasma atomic emission spectroscopy. Over limit values for silver, lead and zinc are determined by the Ag/Pb/Zn-OG62 method that utilizes a four acid digestion followed by an atomic emission spectroscopy finish. Over limit values for silver determined by the Ag-OG62 method are re-analyzed using the Ag-GRA21 method which involves fire assay preparation using 30 gram charge and a gravimetric finish. Over limit values for zinc determined by the Zn-OG62 method are re-analyzed using the Zn-VOL50 method involving four acid digestion followed by titration. Soil sample gold analyses were by the Au-ICP21 technique that involves fire assay preparation using a 30 gram charge with an inductively coupled plasma atomic emission spectrometry finish. Multi element data for 51 elements was determined for soils by the ME-MS41 procedure that involves an aqua regia digestion followed by inductively coupled plasma mass spectrometry and inductively coupled plasma atomic emission spectroscopy. All prospecting grab samples reported in this release represent significant results only. Below detection values for gold, copper, silver, lead and zinc were encountered in grab samples from the 2018 program. 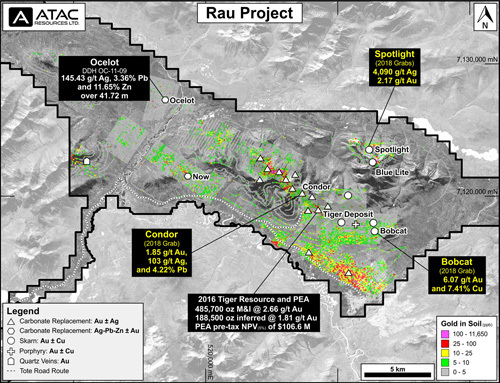 ATAC is a Yukon-based exploration company focused on developing Canada’s only Carlin-type gold district and intrusion-related polymetallic targets at the Rackla Gold Property. Work on the ~1,700 km2 property has resulted in the Osiris Project Inferred Mineral Resource of 1,685,000 oz of gold at an average grade of 4.23 g/t (in 12.4 Mt), a positive Preliminary Economic Assessment for the Tiger Gold Deposit and multiple base metal discoveries. ATAC is well-financed with approximately $10 million in working capital.